When heated, corn, sunflower, palm and soya bean oils – under the umbrella term “vegetable” oils – release chemicals (toxic by-products) called aldehydes which have been additionally linked to neuro-degenerative diseases such as Alzheimer’s, heart diseases, “malformations” during pregnancy, inflammation, an increase in the risk of ulcers and a rise in blood pressure. In results that threaten to turn on its head official advice that oils rich in polyunsaturated fatty acids (PUFA) – such as corn oil and sunflower oil – are better for our health than saturated fats in animal products, recent experiments have determined that vegetable oil when cooked at high temperatures releases toxic chemicals linked to cancer and other diseases. Michael Mosley (of the 5:2 Diet fame) and the ‘Trust me I’m a Doctor’ team banded together with Professor Martin Grootveld, a professor of bioanalytical chemistry and chemical pathology from the DeMontfort University Leicester, UK. Mosley initially gave Leicester residents a variety of fats and oils and asked these volunteers to use them in their everyday cooking. The volunteers were also asked to collect any leftover oil which would then be analysed. The fats and oils they used included sunflower oil, vegetable oil, corn oil, cold pressed rapeseed oil (known as canola oil in Australia), olive oil (refined and extra virgin), butter and goose fat. After cooking, samples of oil and fat were collected and sent to Leicester School of Pharmacy at De Montfort University. Grootveld and his team ran a parallel experiment where they heated up these same oils and fats to frying temperatures. What Happens to Oils Under High Temperatures? When frying or cooking at a high temperature (at or close to 180C or 356F), the molecular structures of the fats and oils change. These oils undergo a process called oxidation; meaning they react with oxygen in the air to form aldehydes and lipid peroxides. At room temperature something similar happens, though more slowly. When lipids go rancid they become oxidised. Lipid peroxidation, or Lipid peroxides refers to the oxidative degradation of lipids (Lipid Oxidation Products – LOPs). The end products of lipid peroxidation are reactive / toxic aldehydes. The creation of toxic aldehydes are a result of degradation of the fatty acids in oil, and although some are volatile (short lived), others remain after frying. That is why they can be found in cooked food. Scientists found that heating up vegetable oils led to the release of high concentrations of LOP’s and aldehydes. Grootveld, providing a relatable example noted in his research showed that “a typical meal of fish and chips, fried in vegetable oil, contained as much as 100 to 200 times more toxic aldehydes than the safe daily limit set by the World Health Organisation”. In contrast heating up butter, olive oil and lard in tests produced much lower levels of aldehydes. Coconut oil produced the lowest levels of these harmful chemicals. Professor Grootveld’s team measured levels of “aldehydic lipid oxidation products”, produced when oils were heated to varying temperatures. 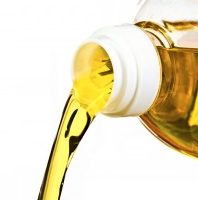 Separate research from the University of Oxford and spearheaded by Professor John Stein, Oxford’s emeritus professor of neuroscience, suggests fatty acids in vegetable oils also contribute to other health problems. Partly as a result of the oxidation of heated corn and sunflower oils, Stein notes that “the human brain is changing in a way that is as serious as climate change threatens to be”. Why? Stein contends that as vegetable oils are rich in omega 6 acids, they are contributing to a reduction in critical omega 3 fatty acids in the brain. When you start heating oils such as corn and sunflower and subjecting them to high amounts of energy in the frying pan or the oven, they undergo a complex series of chemical reactions which results in the accumulation of large amounts of toxic compounds – namely aldehydes and LOP’s. The most obvious solution to reduce the generation of LOPs in culinary oils during frying is to avoid consuming foods fried in PUFA rich oils as much as possible. Grootveld notes that when these oils when “completely pure and authentic they offer no threats to human health” but that “LOPs arising from the frequent and common use of polyunsaturated fats” for frying “certainly do so”. Firstly, try to do less frying, particularly at high temperatures. If you are frying, minimise the amount of oil you use, and also take steps to remove the oil from the outside of the fried food, perhaps with a paper towel. To reduce aldehyde production go for an oil or fat hig in monounsaturated or saturated lipids (preferably greater than 60% for one or the other, and more than 80% for the two combined), and low in polyunsaturates (less than 20%). Grootveld believes that the ideal “compromise” oil for cooking purposes is olive oil, “because it is about 76% monounsaturates, 14% saturates and only 10% polyunsaturates – monounsaturates and saturates are much more resistant to oxidation than polyunsaturates”. When it comes to cooking it doesn’t seem to matter whether the olive oil is “extra virgin” or not. “The antioxidant levels present in the extra virgin products are insufficient to protect us against heat-induced oxidation” noted Grootveld. Judging by the results it seems one is hard pressed (pun intended!) to ignore coconut oil. 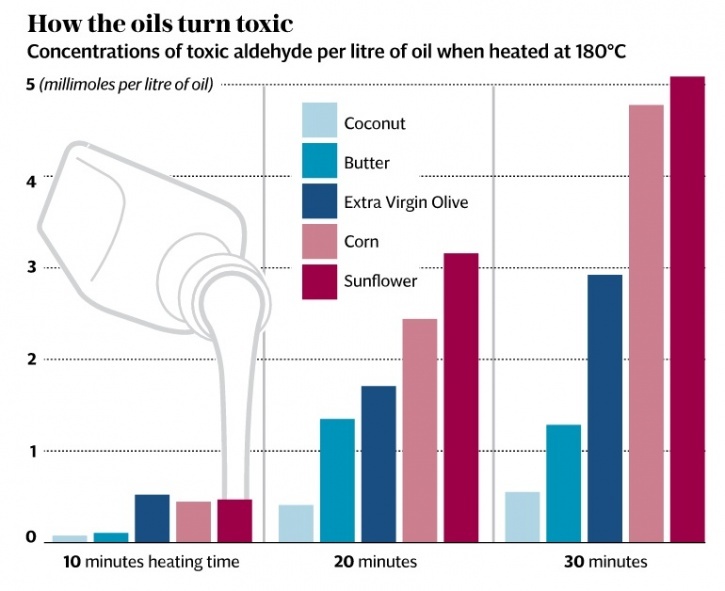 The concentrations of toxic aldehydes per litre of oil when heated to 180C are lowest out of all the oils, even olive oil over 10, 20 and 30 minutes of cooking time. A final bit of advice – always keep your oils in a cupboard, out of the light, and try not to reuse already heated oils as this also leads to the accumulation of even more nasty side-products.